Did the Computerless Computer Teacher Ever Get a Computer? He was the computer teacher without a computer. Then his story went viral — and his life (and classroom) changed. 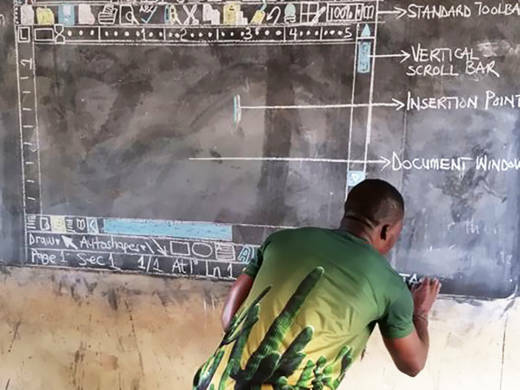 On March 1, NPR published a story about Owura Kwadwo Hottish, 33, who painstakingly drew a computer screen on a chalkboard to teach his computerless middle school students in Kumasi, Ghana, about Microsoft Word and other computer software. Other news outlets, including the BBC and Quartz, covered his story as well. Since then, he has been receiving worldwide support — and even a few computers. The first computer, a laptop, arrived to the Betenase M/A Junior High School on March 8. It was sent by Amirah Alharthi, a Saudi Ph.D. student living in the U.K. In an email to NPR, she said she was moved by the teachings of Islam to take action. "Also, I am thinking of how many genius people the world has lost because they did not have fair opportunities," she wrote. "And that makes me very sad." On March 12, he received a second donation: five new desktop computers for the school, a laptop for himself and three boxes of textbooks on information and communications technology. This was donated by NIIT, an Indian-owned technical college in Ghana, according to Hottish. "Tell your [NPR] viewers, we are waiting for theirs," teased Hottish to NPR via Whatsapp. And Microsoft made a donation, as well, after receiving thousands of requests on Twitter in late February. Sarah Alamshaw, a spokesperson from Microsoft, told NPR that the company will give Hottish a laptop and a voucher for professional development training under the Microsoft Certified Educator Program, to help him better integrate ICT into his teaching. In addition, on March 13 the company sent him to Singapore for the Microsoft Global Education Exchange Summit, where 400 educators and schoolteachers from 91 countries gathered to discuss the role of technology in education. According to a statement from Microsoft, Hottish was a "star" at the event and earned a standing ovation when he took the stage. "Your work has really inspired the world. It really shows the amazing innovation and commitment and passion that teachers have for helping their students get ready for the future," says Anthony Salcito, vice president of Worldwide Education at Microsoft. But while this story has a happy ending, not all global education researchers are satisfied. "[Hottish's story] is a representation of the failure of Ghana's curriculum," tweeted Brendan J. Rigby, a Melbourne-based education professional at the Department of Education and Training Victoria and the founder of a global development blog called WhyDev. In 2015, Rigby helped conduct a study of out-of-school children in Ghana with UNICEF. "Many rural schools are without electricity or the necessary resources to adequately teach ICT, and enable students to effectively learn [this] as a subject," he tweeted. "There are far more pressing issues within [Ghana's education] system — equity, literacy, numeracy, inclusion and achievement."